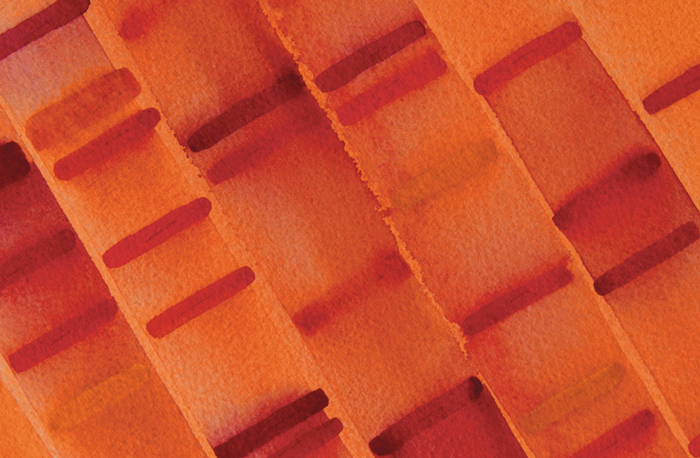 Detail from Orange Electrophoresis, watercolor painting by Michele Banks 2016. In 1966, two contrasting views of genetic variability held sway. The “classical” view posited that mutations were rare and harmful, and that most individuals in a population are homozygous for the wild type version of a gene. The “balance” view held that balancing selection often maintained multiple common versions of a gene in a population, with many individuals being heterozygous. But the debate was stuck. “Population genetics seemed doomed to a perpetual struggle between alternative interpretations of great masses of inevitably ambiguous data,” wrote Lewontin in 1991. Part of the trouble was a lack of hard data. In the age before DNA sequencing, describing genetic variation in the wild was a piecemeal task, only possible in a few select cases. Geneticists could study the variability of specific traits with a clear genetic basis, such as snail shell patterns or human blood groups, or they could study major chromosomal variants, such as inversion polymorphisms in wild fruit flies. They could infer the extent of variation through statistical analysis of breeding experiments. But without the ability to isolate specific genes, there was no way to perform an unbiased survey of genome-wide variation. So convinced was Lewontin of the importance of this insight that he moved his lab to the University of Chicago, where he collaborated with Hubby. The pair quickly began surveying protein variability in Drosophila pseudoobscura, a wild cousin of the famous laboratory fruit fly beloved by geneticists. As Lewontin had hoped, they found electrophoretic variation in D. pseudoobscura proteins showed simple Mendelian inheritance, meaning the protein differences they were measuring corresponded directly to genetic variants. But to their surprise, around a third of the surveyed genes varied between individuals. To quantify this variation across five different D. pseudoobscura populations, they developed a simple summary of genetic diversity, “H” or expected heterozygosity, that is still widely used today. H provides an estimate of the chance that any two alleles at one gene are different, and with this measure, Hubby and Lewontin demonstrated substantial natural variability in all the sampled populations. It also turned out to be a boon for understanding the evolutionary histories of organisms without fossil records. In a parallel eruption of protein electrophoresis studies, geneticists combined the protein data with measures of “genetic distance” between species (such as Nei’s “D”) to estimate phylogenies and divergence times between populations and species. Ironically, Lewontin was wrong in predicting the methods would break the deadlock of the classical/balance debate. Instead, the influx of data raised new questions and complications, and stimulated new avenues for debate. Hubby and Lewontin’s method is the direct ancestor of today’s studies of genetic variation using genome sequence data, but the field’s fundamental question remains active: What are the most important causes of genetic variation? The solution to the problem of natural diversity may well emerge from another meeting between scientists from different fields, drawn into a new conversation. Hubby, J. L., & Lewontin, R. C. (1966). A molecular approach to the study of genic heterozygosity in natural populations. I. The number of alleles at different loci in Drosophila pseudoobscura. Genetics, 54(2), 577. Lewontin, R. C., & Hubby, J. L. (1966). A molecular approach to the study of genic heterozygosity in natural populations. II. Amount of variation and degree of heterozygosity in natural populations of Drosophila pseudoobscura.Genetics, 54(2), 595. Lewontin, R. C. (1991). Twenty-five years ago in Genetics: electrophoresis in the development of evolutionary genetics: milestone or millstone?. Genetics,128(4), 657.